Daekwon Mitchell's 100-meter state championship highlights the Spartans' sports year. The spring was where it was at for the Hilhi Spartans last year. The baseball and softball teams both won conference titles, and despite surprisingly early exits from the state playoffs, one can't help but consider the season a success. "It was a successful season for the guys, for me, the program, and it does feel good," head coach Bob Berent said, begrudgingly, after the Spartans baseball team was eliminated by Corvallis. "But it will take a couple days to recover from the loss, and now we need to look forward to what the younger guys will bring next year." The Spartan boys finished 15-2 in league play after starting the season with nine consecutive non-league defeats. They clinched the conference with two wins over league-leading Sandy to end the year, before dropping a 6-5 playoff game to Corvallis. Curran Mitzel, Hilhi's pitcher and outfielder, was selected as the NWOC Player of the Year and was voted first-team All-State. The softball team won the conference by a game over Putnam, then — like the boys — were upset in the playoffs' opening round by Lebanon, also by a final score of 6-5. The Spartan girls were led by standout pitcher Payton Goodrich, who signed a letter of intent to play softball for the Oregon State Beavers this coming spring. 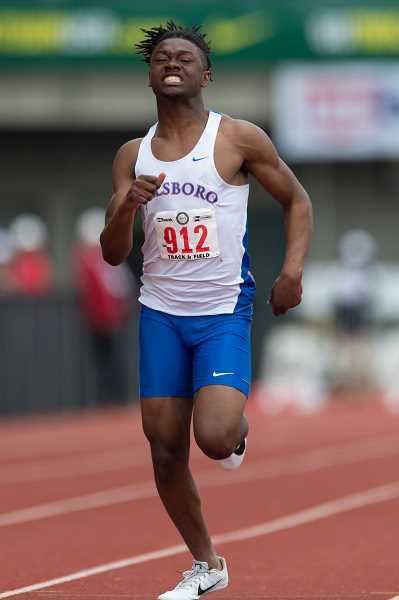 On the track, the Spartans' Daekwon Mitchell earned his stripes, surprising even himself by winning the 100 meters and setting a personal record with a time of 10.96 at the 5A state track and field championships in Eugene. "Winning meant a lot and it wasn't something I was really expecting," said Mitchell. "My main goal was to get the 10.9, but it definitely meant a lot to win the championship, and it was a very big surprise and something I definitely didn't think would happen." Mitchell also finished third in the 200 meters at state. Hillsboro's football team, with its third head coach in two years, came alive late this season under first-year coach Dan Shuff. The Spartans nearly secured a playoff bid after winning their final three games and finishing with a 4-5 overall record. They had 12 players honored by the conference as part of their postseason awards, and Hillsboro tight end Nate Smith garnered honorable-mention All-State honors. The boys' and girls' soccer teams both qualified for state; however, both lost in the playoffs' first round, the girls to Thurston and the boys at the hands of the Central Panthers. The two teams had 12 players in total selected All-League, five boys and seven girls, including honorable mentions. The Spartans' Taliya Miyama and Chance Saechao were honored with All-State second-team selections. On the mat, Hillsboro was led by juniors Nick Peterson and Cole Siemon, who scored 16 points apiece at the state meet, with Peterson finishing third in the 138-pound division, while Siemon was fourth amongst the 126-pounders. Other Hillsboro state point-earners included junior Christopher Day (182) with three points and sophomore Damon Chavez (113) with four points. Lastly, on the hardwood, it was a long year for the Spartan boys, while the girls held their own. The boys finished 6-18 overall and eighth in the NWOC, while the girls were 13-13 overall and 9-5 in conference play, finishing third and qualifying for the play-in round, where they defeated Summit before dropping a 34-31 contest to Central in the first round. The Spartan girls were led by four-year starter Katherine Salas, who was a first-team All-League selection.